Löscht Dateien / Ordner dauerhaft von Festplatten, USB-Flash-Laufwerken, Speicherkarten usw. 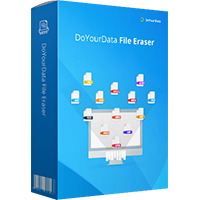 DoYourData File Eraser 2.1 (Win&Mac) war am 1. Mai 2018! als Giveaway verfügbar! Gelöschte, formatierte oder verlorene Daten können heutzutage von Datenwiederherstellungssoftware wiederhergestellt werden. Um Datenwiederherstellung zu vermeiden, braucht ihr dieses Tool! DoYourData File Eraser kann euch helfen, bestimmte Dateien / Ordner sicher und dauerhaft zu löschen - keine Chance für die Datenwiederherstellung. Kostenlose Datenwiederherstellungssoftware zum Wiederherstellen von gelöschten oder verlorenen Dateien von SSD / HDD, externen Festplatte, USB-Flash-Laufwerken, Speicherkarten usw. Sehr einfach zu bedienende, jedoch leistungsstarke iPhone-Datenrettungssoftware, um verlorene Kontakte, SMS, Fotos, Videos usw. von Apple-Geräten oder iTunes / iCloud-Backups abzurufen. Vollständiges, dauerhaftes Löschen von Dateien/Ordnern von eurer Festplatte - genießt den freien Speicherplatz. Nach dem Löschen können die Daten nicht mehr mit Hilfe von Datenwiederherstellungssoftware wiederhergestellt werden. For $9.99, you'd expect more - the homepage shows this version is lacking a privacy cleaner (internet cache, cookies), and lacks free space erasure and entire hard drive. Plenty of free cleaners out there that do everything this does and more. Could go on listing, but everyone will have their favourite utilities. Even as a free giveaway, this seems limited compared to just the free tools already out there, so I'll give it a miss today. For $9.99, you'd expect more - the homepage shows this version is lacking a privacy cleaner (internet cache, cookies), and lacks free space erasure and entire hard drive. Plenty of free cleaners out there that do everything this does and more. The ever popular free CCleaner can erase free space/whole drive, and of course clean up internet traces. Can also add files or folders to remove, as well as many other useful tools. https://www.ccleaner.com/ Then there's the free Eraser which has been going for years: https://eraser.heidi.ie/ Can grab IObit's file shredder as part of the free Advanced System Care: https://www.iobit.com/en/index.php Could go on listing, but everyone will have their favourite utilities. Even as a free giveaway, this seems limited compared to just the free tools already out there, so I'll give it a miss today. GOTD regular TK flagged this up some time back on this comment thread; his / her observation about never trusting a software supplier so unethical that it tries to profit off the back of someone else's product is as relevant now as it was then. Thanks, GOTD, but no thanks: this Chinese developer needs to start being a darn sight more honest before I'd trust any of its software with a place on my computer. Still up to its old tricks: today's developer continues to publish 'reviews' on its website of competitor products with download buttons that <i>seem</i> to be for the software under review but are, in truth, downloads of its own -- including this one: https://www.doyourdata.com/erase-data/ccleaner-data-erasure.html GOTD regular TK flagged this up some time back on this comment thread; his / her observation about never trusting a software supplier so unethical that it tries to profit off the back of someone else's product is as relevant now as it was then. Thanks, GOTD, but no thanks: this Chinese developer needs to start being a darn sight more honest before I'd trust any of its software with a place on my computer. A question for the developer - this and other similar products claim they can permanently erase individual file(s) from SSDs and USB memory sticks. These devices use 'wear leveling' algorithms which map logical sectors to lesser used physical sectors to protect the same areas in NAND memory and this mapping is invisible to software. Of course I could delete 'password.dat' then run your program to wipe all freespace which should actually destroy the data but it could be quite slow just to eradicate a tiny file. Sorry for the nerdy question but if you could explain how you wipe an individual file without writing to all the unused space on a SSD it would be very much appreciated. Just like to get a clear understanding as some of us are security retentive. Thanks! A question for the developer - this and other similar products claim they can permanently erase individual file(s) from SSDs and USB memory sticks. These devices use 'wear leveling' algorithms which map logical sectors to lesser used physical sectors to protect the same areas in NAND memory and this mapping is invisible to software. So he first time I store 'password.dat' to the SSD it might appear to the operating system as sectors 100-109 (which could be mapped to physical sectors 200-209 arbitrarily.) Now when I run your software I assume it says 'a-ha, I'll write some random pattern to sectors 100-109 which the SSD could now map to sectors 210-219.) My original data is still sitting in the memory chips where they were first written. Granted it would be difficult but not impossible for other software to recover my password.dat file (one solution would be to allocate all free sectors in the file allocation table to a 'new' file without actually writing data to the sector and you could paw through all the freespace on the drive.) Of course I could delete 'password.dat' then run your program to wipe all freespace which should actually destroy the data but it could be quite slow just to eradicate a tiny file. Sorry for the nerdy question but if you could explain how you wipe an individual file without writing to all the unused space on a SSD it would be very much appreciated. Just like to get a clear understanding as some of us are security retentive. Thanks!